This application will export GL data, generated at Night Audit in a file named GAGLTRAN.FIL, into a common format that can be easily imported into your own GL software. This application allows you to create a translation table between the PMS GL codes and your own GL software, ensuring that the exported file contains the most easily importable data. The application is ETGLExport.exe and it's located in the PMS software hotel folder on the server. Locate and open the folder and then double-click ETGLExport.exe to run it. 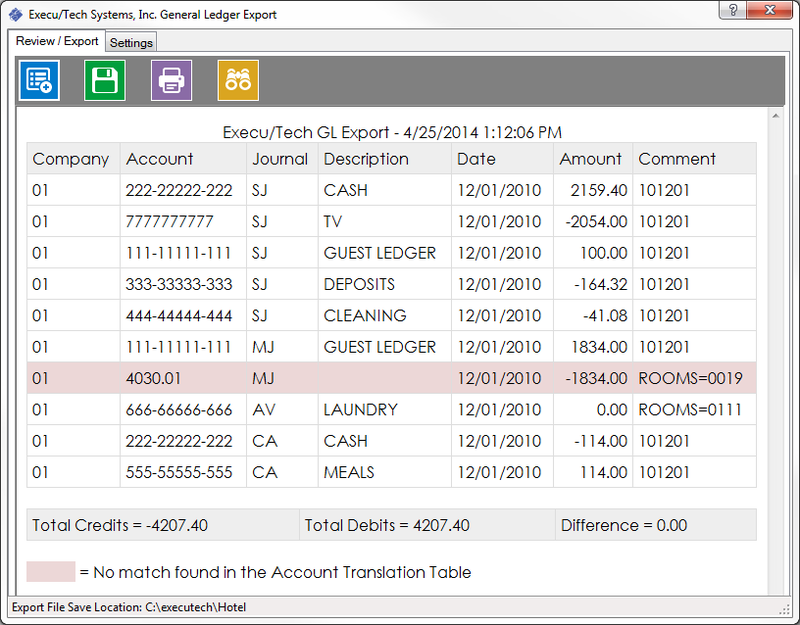 If you wish, Execu/Tech will add this to your Manager or Night Audit menu or provide instructions upon request. Although Settings is the second tab in the application, it's the first thing you need to know, so it's first in the instructions. Without properly configured settings, the export will fail. This is where you set up a translation table to link the PMS GL account with the accounting system accounts. This will reload the settings file if someone else had modified it while the application is open. This allows you to specify what type of file to generate. You can choose between comma separated and tab separated. This check box allows you to add a header to the export file. In the Status Bar at the bottom left of the application window, you'll see the "Export File Save Location" which tells you where the export file is saved. This folder will be selected the first time you save an export file and will become the default folder for all manual and automatic export file creations. This folder can be changed at any time by performing a manual export and selecting a different save location. Each account that needs to be imported, whether on the Execu/Tech side or the 3rd party accounting side needs to be listed on a separate line. Each of the 3 columns must be filled out for each account. If you have a lot of account numbers in your accounting software or in the PMS software, you can create a worksheet in Excel to speed up this process. This overwrites the current account settings. You'll need 3 columns, no header. All columns are required or the account won't work. Save the file as a tab delimited format named ETGLExport.table.ini. Copy this file to the PMS software folder. Run the export application and you should see these accounts in the settings tab. The Review / Export tab is where you can review the data to be exported, print a report of this data, and catch any potential errors before the import is completed. This loads the GL detail file created by the PMS. This must be done before you can export. This saves the new, formatted export file. This prints an export report, showing you what will be exported and identifying any errors like out of balance credits and debits or any transactions without a matching "Export Account". This lets you view a text representation of the file that will be exported. The export file will be placed in folder selected when you save. The Status Bar, at the lower left, will show you the default location. Review the displayed report to identify any errors and fix them if possible. If there are missing "Export Accounts", you'll need to add them, save the settings, then reload the GL detail file. If you don't see a report appear with details, your exported file will be blank. 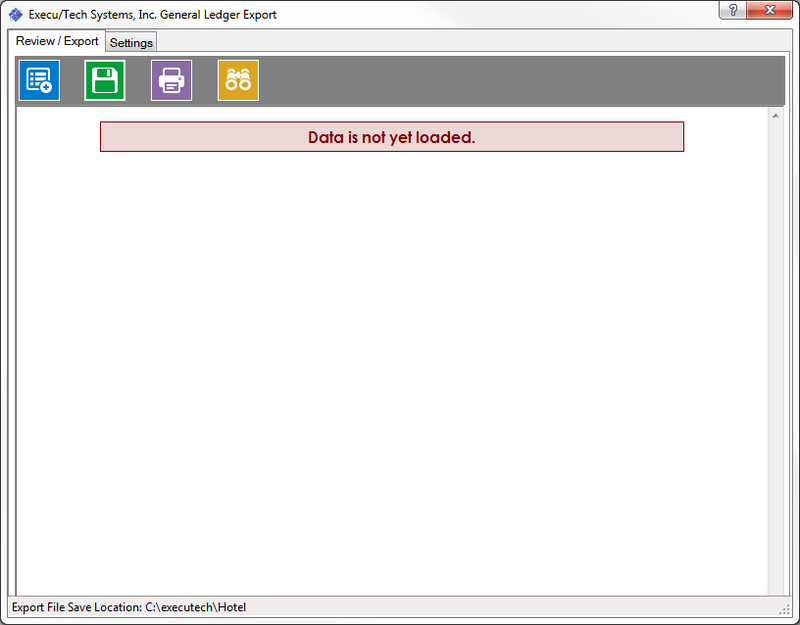 Try again, you missed a step or there is no GL data to import. Click the green "Save" button and the export file will be saved. After saving the export for the first time, the folder will be saved. This folder will be used when running in 'auto' mode. Or, it can be run automatically during Night Audit. 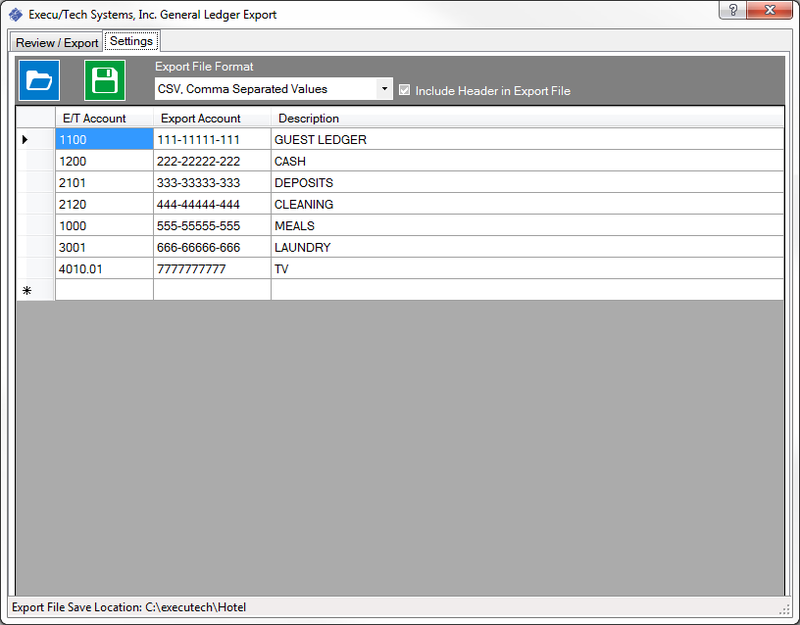 This is a sample of the export file with a header in CSV format.